If you live in Brighton Lewes is a great destination for a walk. It's an absolute gem of a place, lots to see, home to Harveys the local brewery, and with plenty of places to eat. 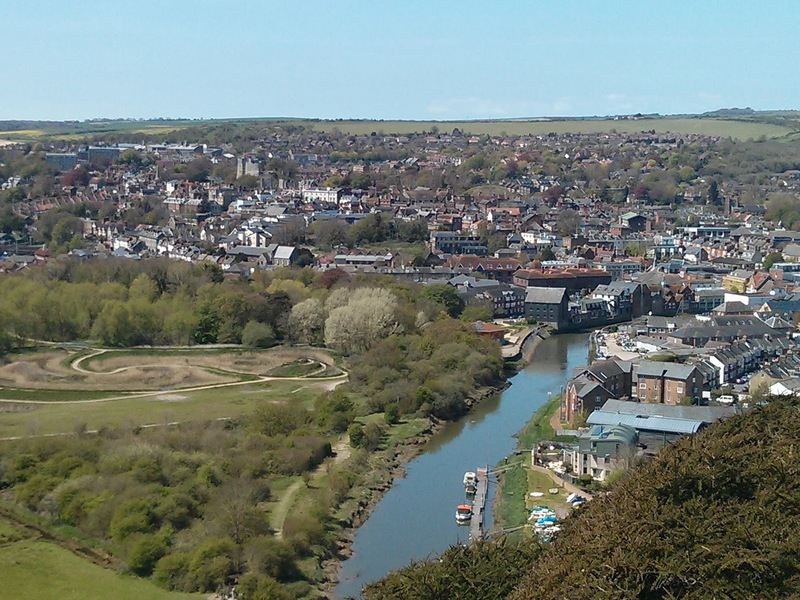 The public transport links between Lewes and Brighton are excellent, both train and bus, and there are lots of ways of creating a one way trip either to or from the town. 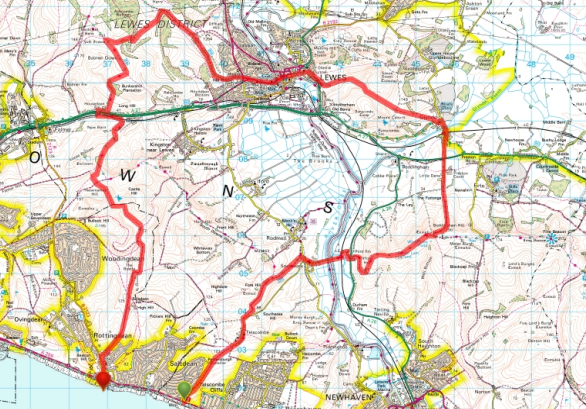 I've been trying to work out the best way to do a circular route for some time, particularly one which took me away from the beautiful but, in my case, overused route along the edge of the South Downs from the west via Ditchling Beacons. The route I took was a long one, 20 miles, but it was easy walking, the weather was great and because it was a bank holiday there were lots of other walkers grabbing the chance to walk across the downs in the sunshine. 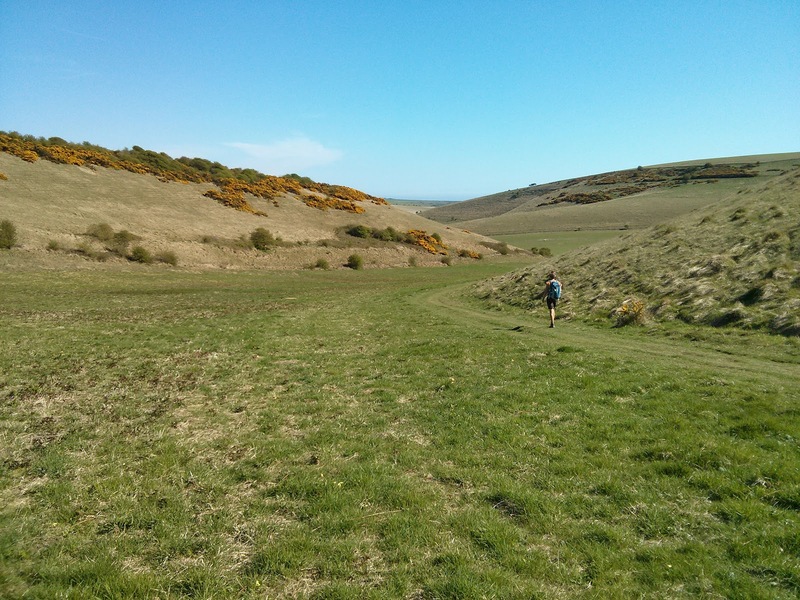 The walk starts at Saltdean, just past the famous art deco lido, and heads north across Telscombe Cliffs through a sliver of the downs separating Saltdean from Peacehaven. Both settlements, particularly Peacehaven, have an interesting history and owe much to the decidedly dodgy efforts of Charles Neville a speculative property developer who bought the cliff tops in the middle of the first world war. 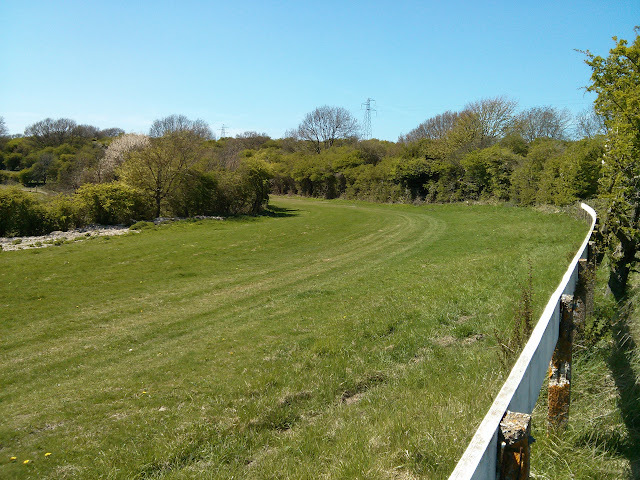 The ugly results were an important part of the eventually successful argument made by those calling for a stronger planning system to protect the best bits of the countryside. We started walking just after 9 and the coastline was covered in mist. 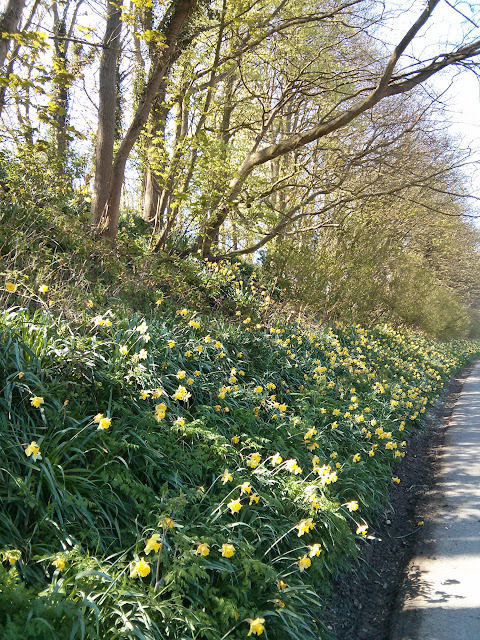 Climbing a bit, and 200 metres inland, we were in bright sunshine with clear blue skies. I think spring is about two weeks late this year, few of the trees are really in leaf, and despite the weather the countryside still has a pinched post wintry feel. 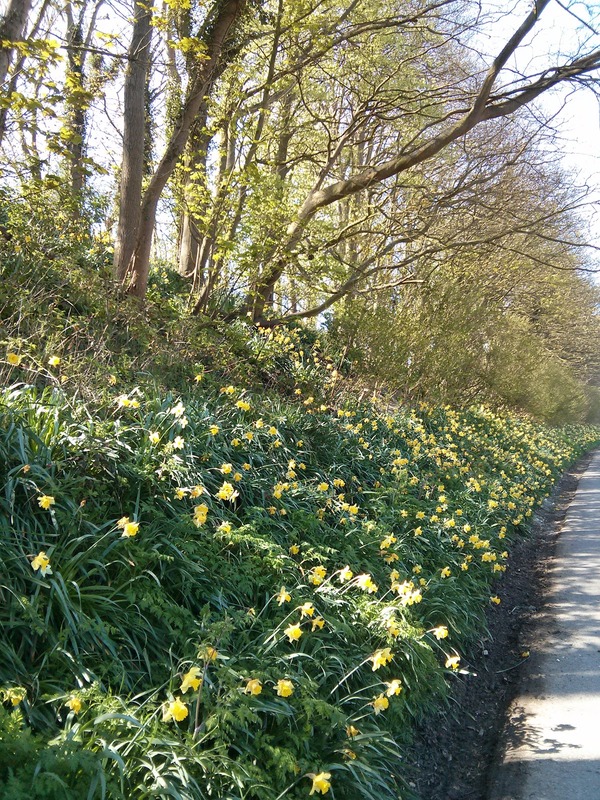 The upside is the wonderful display of daffodils on the side of the road walking in the tiny village of Telscombe. Beyond Telscombe the route drops down into the first of many beautiful dry valley's, takes you through a scruffy farmstead (we nicknamed it "cold comfort farm" - it has that feel) before joining the South Downs Way. The fields are full of cattle and a thin bit of wire provides the only barrier between us and a happy looking Aberdeen Angus bull. Southease, which has a church with a round tower, was getting ready for a May Bank holiday fete on the village green which we passed through before heading down to the bridge over the River Ouse. Just to the north of our crossing point is the place where Virgina Woolf, who had lived in the nearby village of Rodmell, ended her life in the river in 1941. I think the views from Beddingham Hill, the next milestone, are some of the best on the South Downs. To the south Newhaven and the English Channel, which today was still covered in the early morning mist; to the southeast the cliffs at Seaford Head and beyond that Beachy Head; to the north, across the valley, and in the gap in the downs between Mount Caburn and Mount Harry, Lewes. Beddingham Hill itself is right on top of the downs with the cliff, facing north, carved out like an amphitheatre. Dropping down the scarp face the route takes you across the valley to the village of Glynde, a junior partner to Glyndebourne, with its opera house, but interesting non-the-less with lots of tiny little cottages suggesting a past which was a bit more industrial. "Trevor" is an important name in these parts with "Trevor" cottages and a pub called the "Trevor Arms". Glynde Place, which features a clock tower, dates back to 1569. Turning west and climbing out of Glynde and up Mount Caburn it was hard not to stare at the dozens of paragliders hovering above the valley. They reminded me of the vultures I had seen in Spain a few weeks ago. Mount Caburn was the location for an Iron Age Fort and it is believed the site has been excavated more times than any other in the UK. 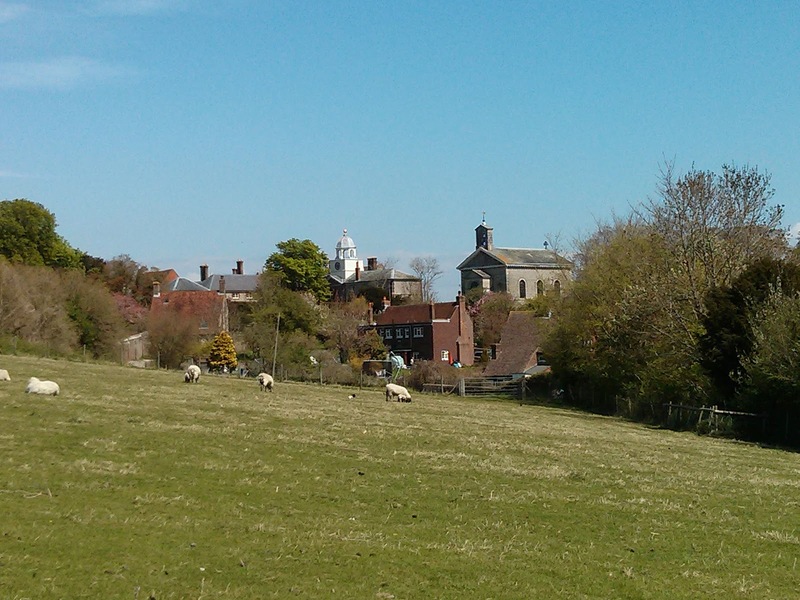 The descent to Lewes takes you through another stunning dry valley - a nature reserve - opening up at the western end to provide great views across the Ouse valley. 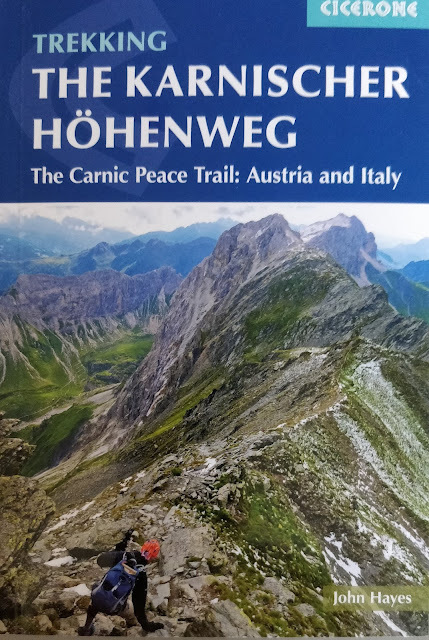 When we were there we shared the walk with lots of other walkers and a herd of tiny cattle and a little white bull whose name, a nervous woman told me, was Robin. Lewes is a lovely town with an interesting radical non-conformist tradition (was home for six years to Tom Paine during which time he wrote "The Rights of Man"), but on a sunny bank holiday it was packed and after coffee and cake, "entertainment" from the Morris dancers, we made our exit. On the way out of town the huge somber Victorian Prison, once home to the gangster Reggie Cray, reminds you that not everyone gets away so so easily. After the prison the route takes you up through a hawthorn tunnel and back onto the downs past the old Lewes racecourse. The track is still used by trainers who occupy buildings located around the original grandstand. 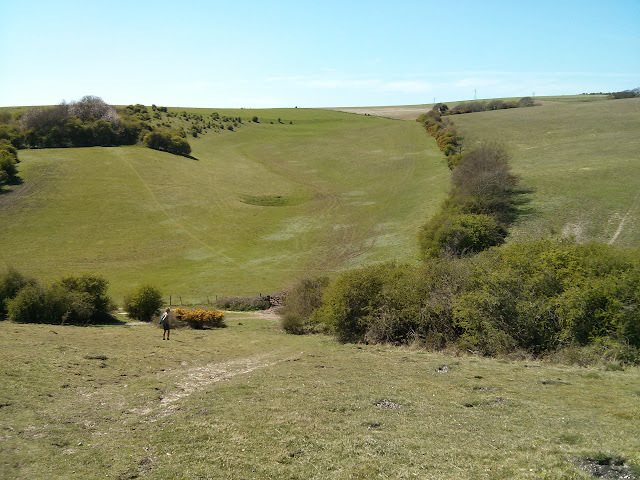 Instead of going all the way up to the Blackcap summit we cut across the down just to the south of Ashcombe Bottom heading across permanent pasture and into another beautiful dry valley. Blackcap is one of numerous National Trust owned sites along the South Downs and the difference between the permanent pasture and cultivated landscape provides a vivid illustration of what the National Trust has preserved. Heading south and down in the Falmer valley the route (now the South Downs Way again) takes you over a footbridge across the busy A27 and back up onto the downs. The road is hidden at the bottom of the valley and once you've climbed up the views along the downs side eastwards towards Lewes are stunning. Over the top of the down the final bit of walk takes you along another dry valley through the Castle Hill nature reserve. So close to Brighton and on a bank holiday Monday we still had the valley to ourselves, incredible. Climbing out of the valley we walked along the little country road into Rottingdean. I'm sure we could have found an off-road alternative but the late afternoon views towards Brighton and the coast - the mist had burnt away a long time ago - more than compensated for a bit of tarmac. We could have stopped for a pint at one of Rottingdean's many pubs but instead jumped on the bus and headed home after what was a perfect day's walk.